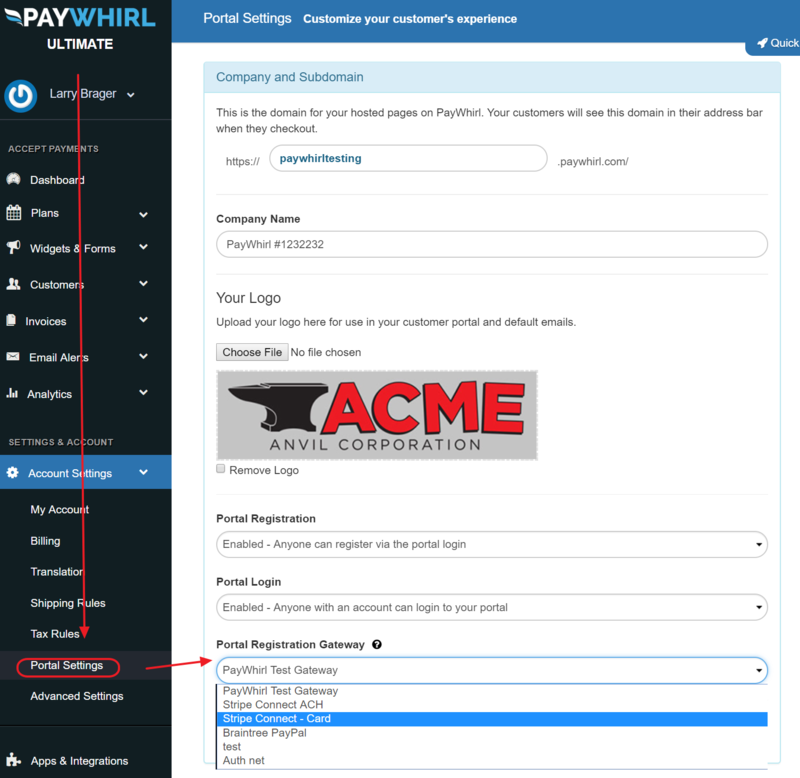 To process payments with PayWhirl you need to connect to a LIVE payment gateway and/or merchant account. The gateway works like a vault to securely store your customer's payment information for future charges. By default, all PayWhirl accounts come connected to our PayWhirl Test Gateway but it's just for simulation / testing purposes. Test customers cannot be converted into "live" accounts or switched to a live payment gateway. To charge your customers and process real money, you have to connect a LIVE payment gateway. 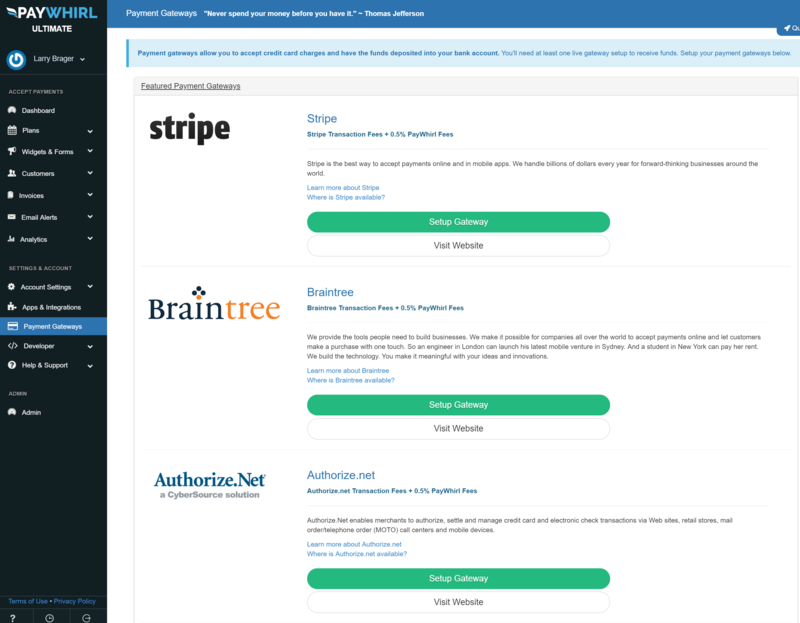 If you'd like to use a gateway other than Stripe, you must be on a monthly paid plan. See this article for more pricing details. *PayPal owns Braintree, to use PayPal as your payment gateway you must create a Braintree account or use the Spreedly vault with PayPal (additional fees apply). 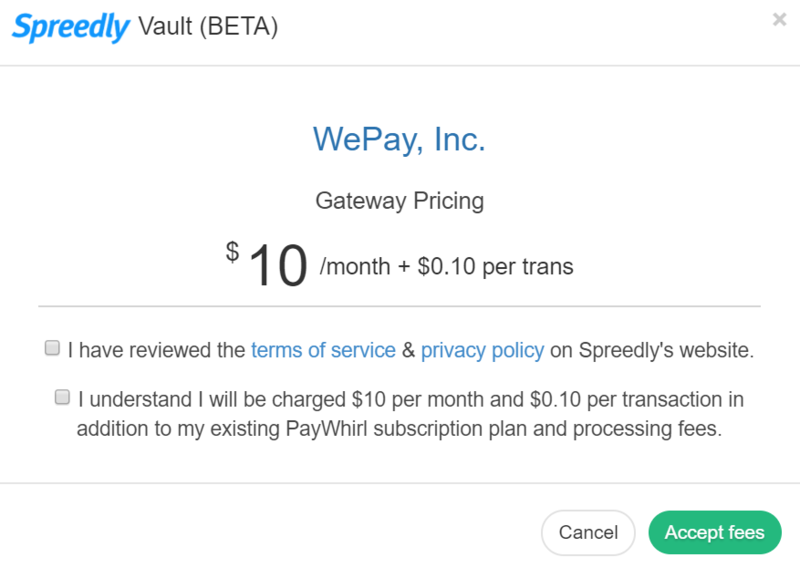 *Spreedly Vault Gateways - Additional PayWhirl $10/Month and 10 cent transaction fees apply. Spreedly Gateways are currently in public beta. Please note that your payment gateway's transaction fees still apply and are separate from PayWhirl transaction fees. 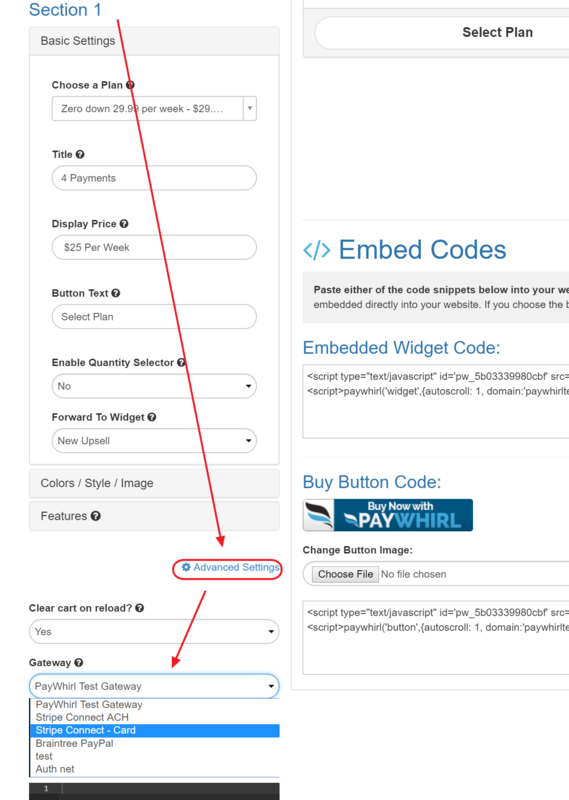 To connect to a LIVE gateway to PayWhirl please navigate to Main Menu > Payment Gateways in your account. Once there, you will see the available gateways available on your specific plan level. Click the "Setup Gateway" button on the gateway you want to connect. Note: If you are on our FREE monthly "Starter" plan you will need to upgrade to access other gateways. Stripe is the only gateway supported on Starter at this time. To connect your account with one of our supported Spreedly vault gateways please navigate to Main Menu > Payment Gateways in your account. From the gateways page, scroll down and select the "Spreedly Vault Gateways" heading to open the list of additional gateways. Click the "Setup Gateway" button on the gateway you'd like to connect. You will be asked to agree to the Spreedly terms of service and accept the additional PayWhirl fees of $10 per month and 10 cent per transaction fees. Suppose you are on our PayWhirl Pro plan ($49/month) and you want to use the WePay gateway. The total charged by PayWhirl would be $59 per month and 2.0% + $0.10 per transaction. 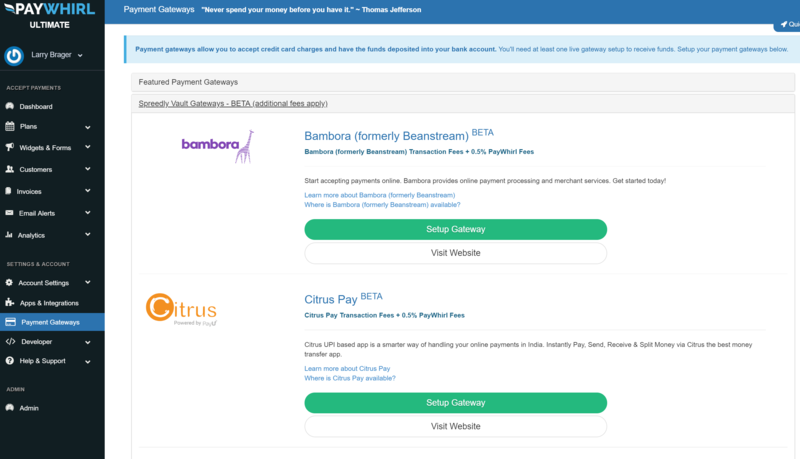 The WePay (or other gateway) fees still apply and are separate. By default widgets you setup will be connected to our test gateway. To make the switch to a live gateway go to the Manage Widgets page and click edit next to the widget you want to connect to your live gateway. Next, click on the advanced settings link in your widget settings and select the new live gateway from the dropdown menu. Finally, click on Account Settings > Portal Settings to set your Portal Registration (if enabled) to use your live payment gateway.